A research team from Tokyo Institute of Technology (Tokyo Tech) and Waseda University have successfully produced high-quality thin film monocrystalline silicon with a reduced crystal defect density down to the silicon wafer level at a growth rate that is more than 10 times higher than before. In principle, this method can improve the raw material yield to nearly 100%. Therefore, it can be expected that this technology will make it possible to drastically reduce manufacturing costs while maintaining the power generation efficiency of monocrystalline silicon solar cells, which are used in most high efficient solar cells. Solar power generation is a method of generating power where solar light energy is converted directly into electricity using a device called a "solar cell." Efficiently converting the solar energy that is constantly striking the earth to generate electricity is an effective solution to the problem of global warming related to CO2 emissions. By making the monocrystalline Si solar cells that are at the core of solar power generation systems thinner, it is possible to greatly reduce raw material costs, which account for about 40% of the current module, and by making them flexible and lighter, usage can be expected to expand and installation costs can be expected to decrease. 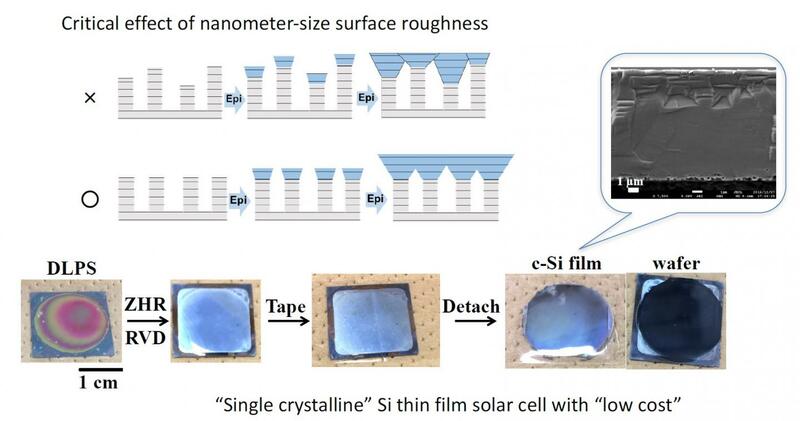 Among the technical challenges related to monocrystalline Si solar cells using lift-off are 1) the formation of a high-quality thin film Si at the Si wafer level, 2) achieving a porous structure that can easily be lifted off (peeled off), 3) improving the growth rate and Si raw material yield (necessary equipment costs are determined by the growth rate), and 4) being able to use the substrate after lift-off without any waste. In order to overcome challenge 1), it was necessary to clarify the main factors that determine the quality of thin film crystals grown on porous silicon, and to develop a technique for controlling these. A joint research team consisting of Professor Manabu Ihara and Assistant Professor Kei Hasegawa of the Tokyo Tech, and Professor Suguru Noda of Waseda University has developed a high-quality thin film monocrystalline silicon with a thickness of about 10 μm and a reduced crystal defect density down to the silicon wafer level at a growth rate that is more than 10 times higher than before. First, double-layer nano-order porous silicon is generated on the surface of a monocrystalline wafer using an electrochemical technique. Next, the surface was smoothed to a roughness of 0.2 to 0.3 nm via a unique zone heating recrystallization method (ZHR method), and this substrate was used for high-speed growth to obtain a moonocrystalline thin film with high crystal quality. The grown film can easily be peeled off using the double-layer porous Si layer, and the substrate can be reused or used as an evaporation source for thin film growth, which greatly reduces material loss. When the surface roughness of the underlying substrate is reduced by changing the ZHR method conditions, the defect density of the thin film crystal that was grown decreased, and the team eventually succeeded in reducing it to the Si wafer level of about 1/10th. This quantitatively shows that a surface roughness in the range of only 0.1-0.2 nm (level of atoms to several tens of layers) has an important impact on the formation of crystal defects, which is also of interest as a crystal growth mechanism. The film formation rate and the conversion rate of the Si source to the thin film Si are bottlenecks in the production of thin-film monocrystalline Si. With chemical vapor deposition (CVD), which is mainly used for epitaxy, the maximum film forming rate is a few μm/h and the yield is about 10%. At the Noda Laboratory of Waseda University, instead of the regular physical vapor deposition (PVD) where raw Si is vaporized at around its melting point of 1414 ?C, by vaporizing the raw Si at much higher temperature of >2000 ?C, a rapid evaporation method (RVD) was developed with a high Si vapor pressure capable of depositing Si at 10 μm/min. Based on the results of this study, not only did the team discover the main factors for improving the quality of crystals during rapid growth on porous silicon used for the lift-off process, they succeeded in controlling these. In the future, measurement of the carrier lifetime of the thin film, which is directly connected to the performances of solar cells, and fabrication of solar cells will be carried out with the goal of putting the technology into practical use. The use of this Si thin films as low cost bottom cells in tandem type solar cells with an efficiency of over 30% will also be considered.